Currently working on an interesting commission that is an outgrowth of some of the art installation work I've done in the past. One of the gallery owners I've worked with has bought a restaurant in Chinatown, and is now transforming the space into a kind of permanent art installation, relying on some of the gallery's stable of artists to design the space. I've just been handed boxes upon boxes of Ipe offcuts (b/w 12-16" in length), and have been tasked with creating a kind of mosaic motif from tiles I will manufacture out of the offcuts layed out over a plywood substrate. I've never worked with Ipe before, so I just have a couple of questions. After setting the tiles in place with the PamTite, I would go back and drive some 18ga. brads from the underside of the plywood to make the tiles more secure. Does anyone anticipate there being a problem using PamTite on Ipe? Second, I've heard that Ipe, being so dense, can be difficult to work with. The offcuts are already thicknessed, but I will have to rip the edges to take off the bevel they currently have, and then probably have to design some sort of jig for my Kapex to create some of the smaller tiles that are required, lest my fingers get too close to the spinning blade with pieces that small. Has anyone had problems when having to cut a large amount of Ipe in terms of dulling blades? Ideally I would also want to have the option for some hand tool action on doing the final fit of some of the tiles, say, something like a shooting board for shaving tiny amounts of the pieces. But given how dense Ipe is, does it make sense to even attempt to work it by hand? I had a bad and unsuccessful experience over the summer trying to work by hand Wenge, a similarly dense wood, which I don't want to repeat. I would also have to spend some time building a custom shooting board for this project, and want to get a sense of whether it's even worth it to devote that kind of time to the prep stage. Edward, I have only worked with Ipe once and I cleaned the joints first with alcohol and then used epoxy and it worked out good. You are correct, Ipe is hard to work with so make sure everything is sharp, but the bigger issue is the sawdust and splinters, make sure to where dust and eye protection. The guy that gave me the Ipe didn't know he was allergic and got a splinter and his hand swelled up, I didn't have the same reaction, but also was more aware of this. It's not the density of ipe that causes the problems, it the oils (gluing) and silica content (dulling). You can experiment with removing oil at the surface of the wood with denatured alcohol. That has worked well for me in the past with rosewoods and cocobolo. I've never used the glue that you are suggesting, but if that works well, let us know. Ipe is a very high silica wood, so cutting it is like running your blade through a stack of sandpaper or a waterstone. That's exagerating, but you get the idea. Other similar woods wrt silica content are jatoba and goncalo alves. You want to cut with carbide, but even at that it will dull blades more quickly than other woods. I've never used any variety of high speed steel on ipe, power or hand. I have worked jatoba with hand tools, and it works OK while the tools are sharp, but be prepared to hone frequently. Use a high angle for planing. Clean the surface with acetone. PamTite is not a good choice for this. Use six10. The brads may not enter the Ipe, it's that hard. I've never tried to work Ipe with hand tools, I have a feeling it wood( ) not be fun. I've found that if you glue freshly machined or sanded surfaces Titebond III works just fine...I have ipe post wraps glued with Titebond that are 3 years out in the weather and doing fine. I've not glued any myself but I use PC-7 epoxy and it works very well. Maybe consider drilling small shallow holes on mating surfaces after wiping with acetone to help the epoxy properly interlock. Tom is right about the brads not entering the wood. I glued some 2x material for wide deck steps with titebondlll and dominoes and four years in the joints are tight. 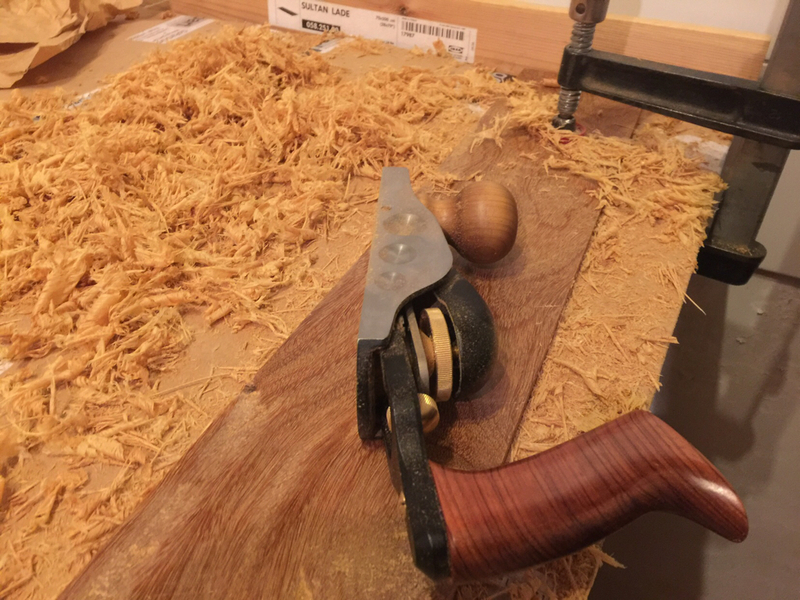 It cuts well with sharp carbide tools but I suspect it would be very hard on hand plane blades so I would keep that to a minimum and completely avoid shooting endgrain. Tinker type story: I live on a fairly busy two lane road and the county has taken out my mailbox when plowing snow. I built a cantilevered post assembly with a lee valley swing-away joint to save everything if the box got hit. That way, the post was on the safe side of my ditch. I buried an ipe 4x4 two feet into the ground and thought I was home free. The mailman loved it. Last year we were out of town for Christmas and when we got back I stopped at the end of the driveway to get the mail. My mailbox was gone, the post, hinge, counterweight behind the box extension, everything. The only thing left was a distorted two foot deep hole in the ground. There was also a bunch of plastic car parts spread all over: headlight assemblies and even a windshield wash fluid container. I finally found my stuff 50 feet down the ditch. We found a note from the county sheriff in our door with an incident number so I called and the officer stopped by to fill me in on what happened. An icy road caused three vehicles to be in my ditch at the same time. A fourth car came around the bend and down the hill having nowhere to go and no way to stop. They chose my ditch and avoided hitting everything but my mailbox. Good and bad for them. No one got hurt but the damage to their car was extensive as they knocked that post out of frozen ground. The post had not a single scratch! I put it back in the hole and filled it with pea gravel so the next time it would come out easier and do less damage to the car. If you don’t have to do 100s of boards and don’t mind a workout in between your sharpening, it can be a nice challenge to work Ipe with habd tools. Grain direction is crucial, due to the hardness. But it was fun and has held up well. I second the glue up after cleaning with acetone. I used a PU-based wood glue.